REST: Keep your standing and walking activities to a minimum while swelling is a problem. ICE: Use an ice pack in a moist towel for 10-15 minutes intermittently to decrease swelling. COMPRESSION: With prolonged standing or walking, use an ace or ankle sleeve for pressure. ELEVATION: Elevating the ankle above the chest will help decrease swelling. MEDICATIONS: Medications as recommended by your physical therapist or doctor. CRUTCH WALKING If you are using crutches, try to walk as normal as comfortable. Use the crutches as much as needed to take weight off the ankle, and relieve pain, but try to use a normal heel-to-toe motion with as much pressure through the foot that is comfortable. ANKLE PUMPS Pump the ankle up and down each 5 minutes. This exercise can be done a number of times a day. 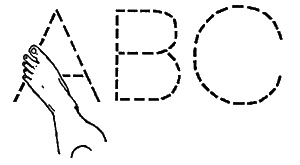 ALPHABET Using the big toe and moving from the ankle joint, trace the alphabet for about 5 minutes. This exercise can be done a number of times a day. 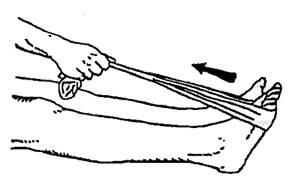 TOWEL/CRUTCH STRETCH Pull the foot back until you feel a stretch at the calf. Hold the stretch for 15 seconds, do 3-5 reps, 1-3 times a day. TOE CURLS Bunch up a towel curling your toes. Do for 5 minutes, 1-3 times a day. TOWEL SLIDES Do for 5 minutes, 1-3 times a day. 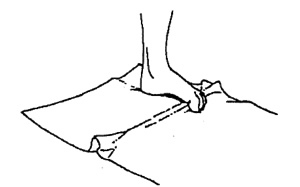 Moving only your ankle and keeping your heel planted, slide the towel to the inside, then outside. seconds. Push to the inside, to the outside, up and down. Do 3 sets of 10-20 repetitions each direction, daily. ALTERNATE: Instead of using your hand for resistance, you can push against the leg of a table or heavy chair. Lay on your back with your hips and knees bent and then lift your hips. Raise up and down on your toes slowly. Start using two legs and progress to one as you are comfortable. Do 10-20 reps, 3 sets, daily. ACHILLES STRETCHES Heel flat on the floor. Bend the knee slightly, moving the hips forward and down until you feel a stretch at your Achilles. Hold for 30 seconds, do 3-5 reps, 3-5 times a day. CALF STRETCHES Heel flat on the floor. Lock the knee straight and move the hips forward until you feel a stretch at the calf. Hold the stretch for 30 seconds, do 3-5 repetitions, 3-5 times a day.